Part of me was hoping to get this done and dusted before the baby arrived, another part was hoping that she'd stay in a cot forever and always be my little girl. Looks like the former happened. When Elizabeth started climbing out of her cot, we knew it was only a matter of time before the cot would become a bed. She made her first escape about 6-8 weeks ago I think but fell and scared herself a bit so didn't try again for a long time. Then, on Saturday 11th August, Elizabeth realised she could get out without hurting herself. A long evening of putting her back in her cot every time she climbed out awaited me and the following day was just as bad, in fact worse. She didn't nap at all the next day and was still awake at 9:30pm. We decided to rearrange her room in the hopes she wouldn't risk falling again. It worked but there were a lot of tears before she finally fell asleep. We left her room in disarray while we spoke about our options and what we were going to do. 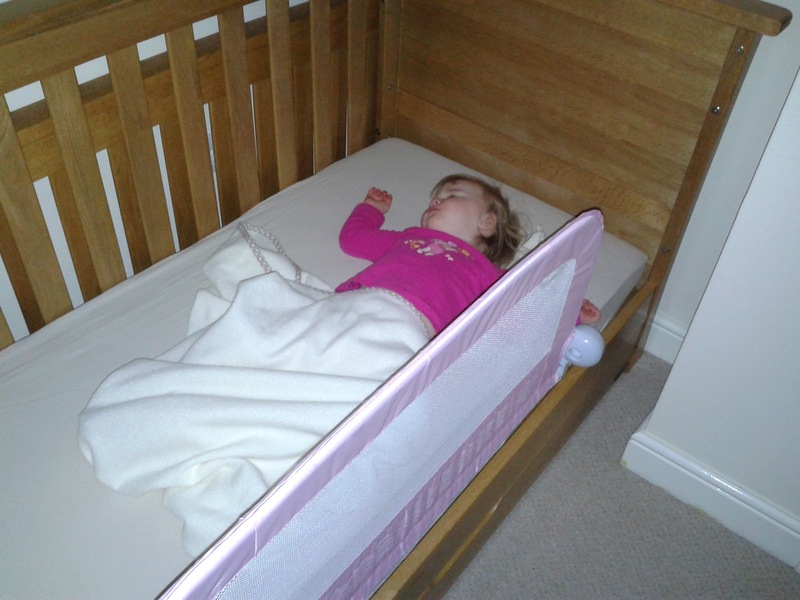 We decided to make her cot into a bed and so we went and bought a bed guard so she couldn't easily fall out. We also started looking at 'big girl bed' options so that we could get everything organised before baby number 2 arrived. We left the bed conversion until the long bank holiday weekend at the end of August so that Frans was around to help out with any tantrums as much as possible. I'm glad we waited! We needed three nights before Elizabeth was happy to go into her bed on her own, after us putting her down. Obviously it was all new and exciting for her so we had some missed naps and very late bedtimes for the first three days. I think by day 4, she was exhausted. I put her in bed for her nap and she was asleep within 20 minutes. That night she went to sleep pretty quickly as well and continued to 'behave' for the rest of the week. So it's now been 12 days since she got her bed and we've had two setbacks. The first was her being ill. Because she was feeling poorly, she wanted lots of cuddles and because she can get out of her bed, she spent most of the night at her door (behind the stair gate we put up) crying and calling for us. Totally heartbreaking! Frans and I ended up taking turns to sit with her until she finally fell asleep just before 10pm. Tuesday we were back on track and yesterday went well too, with Elizabeth falling asleep last night within 30 minutes of going to bed. I felt that we were lucky that she got over her cold so quickly. But then disaster struck at about 3:30 this morning. I heard a horrendous thud and very loud screams - Elizabeth had somehow fallen out of her bed. From the position I found her in, I can only assume she had tried to climb out in her sleepy state. She howled for quite some time and wouldn't let go of me. I ended up having to wake Frans (who had only gone to bed at 2:30am due to work) to help me try and get Elizabeth back into bed. Being 9 months pregnant isn't helpful in that situation. Elizabeth unfortunately just wanted cuddles with Mummy so Frans (bless him) took over and tried to settle her. It seemed to work but as he was exiting her room, she woke and the cries started again - but didn't really stop. We spent the next hour trying everything to get her to go to sleep but nothing worked so eventually we left her in her room, closed our door and waited. After a short while, the crying stopped but I don't think she went to sleep. I certainly didn't :( Then at 6am, Elizabeth was adament that it was time to get up and the crying started again, with 'poo' cutting in every few seconds. So up I got, hoping to be able to get some sleep when Elizabeth went to sleep at what I was sure would be a sensible time. However, she has only just fallen asleep 15 minutes ago, the time she'd normally have a nap, but it has taken an hour of crying, eye-rubbing, taking her nappy off, repeatedly putting her back in bed, holding the door closed and me just ignoring her before Elizabeth finally succummbed to sleep. So now I'm going to get 40 winks as well - I hope!